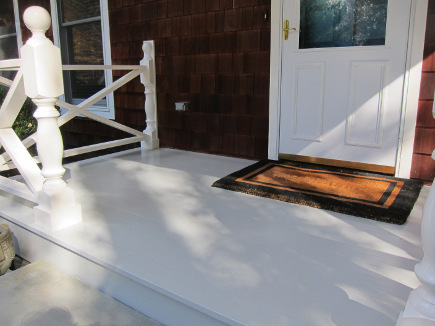 I was able to finish the front porch redo on a beaten up floor before the autumn leaves fell. The project began last Spring. 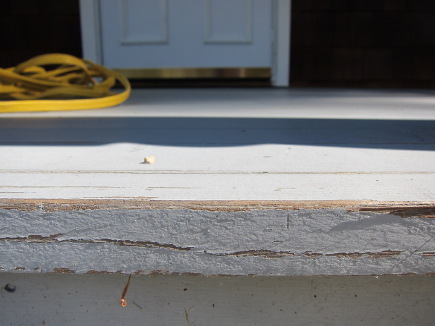 That’s when I noticed that the 10-year old boards on the front and sides of the front porch had begun to rot. 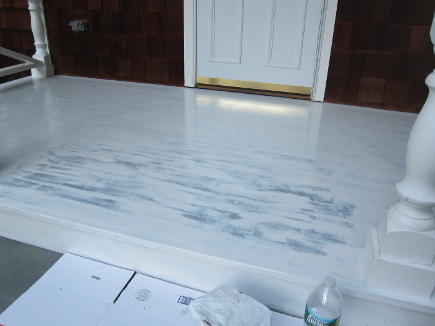 The culprit, I believed, was the water-based porch floor paint which didn’t properly seal the surface. Our porch faces west and takes a beating from snow blowing across it in winter and sun beating down directly during the summer. 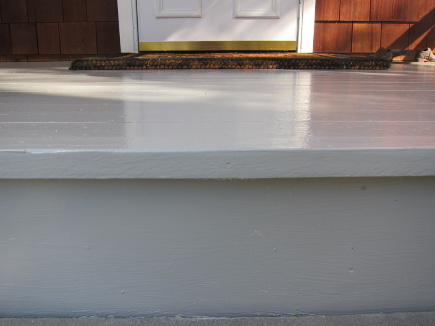 I had put off my front porch redo because the floor required sanding before it could be primed and repainted. Five years ago I repainted the posts, newels and trim with white Fine Paints of Europe Dutchlac brilliant, a high-gloss oil-based coating. The floor needed the toughness of oil-base paint, as well. After the carpenter finished all the needed repairs I faced the dreaded sanding chore. And the project had a deadline. If the weather turned too cold or too wet, the oil-based paint wouldn’t dry properly. If it was too windy, leaves would be blown across the porch and might stick to the wet enamel. Fortunately, mother nature stayed in my corner. 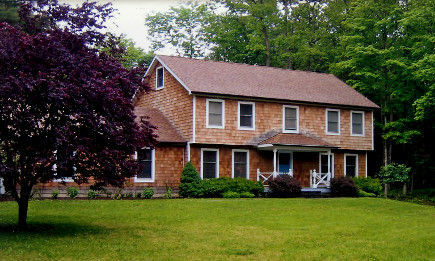 When we first bought the house there was no porch, no access to the front door, and no cedar shakes. And when Mr. AM demanded that we change out the vinyl siding for architectural cedar shingles it was clear we needed to properly highlight the front entrance. Our contractor wanted to extend the porch all the way across the front of the house to help hide the ugly second-floor overhang. 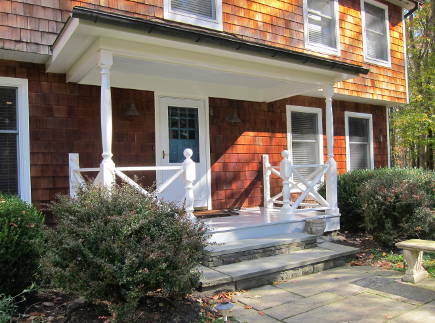 I liked that idea in principle, but then I realized that a 50-foot long painted porch would be a nightmare to maintain. I cut it down to 15-feet. (Our contractor, who’s also a friend still talks about changing it but I’ll leave that project for the next owner). Meanwhile, the water base floor paint had been weathering badly. The front edge, just above the stone steps, had started to shear and the paint was flaking. Off I went to Home Depot to see about renting a sander I could handle that also would do the job efficiently. They had a good one but the rental was about the same price as the Skil [above] with a catch basin I found at the local hardware store. 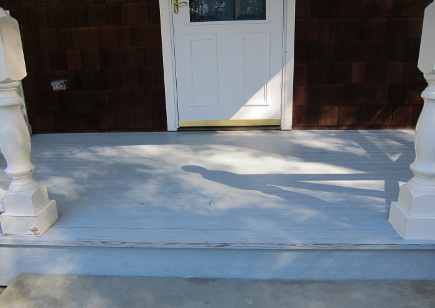 Before sanding, I swept the porch and removed the big seagrass mat and the boot scraper. I strapped on my kneepads and went to work. 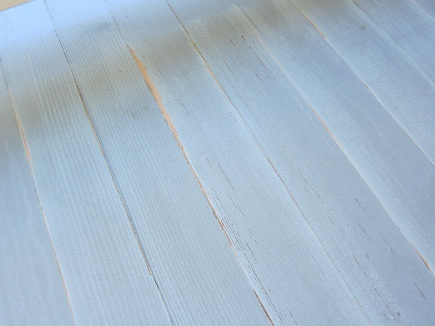 The sander stripped off the loose paint layers beautifully – and surprisingly quickly. And it stripped the floor boards enough to have the oil-based primer adhere very well. The entire sanding job took about two hours. 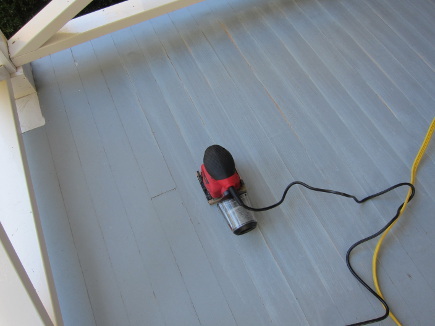 After sanding, I vacuumed the porch and went over it with a damp microfiber mop. I was surprised how much powdered paint came off on the mop. Once dry, I began applying the Fine Paints of Europe bullet-proof oil-based primer. Wanting that to go on perfectly, I selected an angled brush that would be good for the floor board crevices, edges and bottoms of the posts. But it was much too small and the oil-based primer isn’t the easiest paint to use. Priming took four back-breaking hours. It left me so exhausted I could hardly bend over long enough to finish the job. So the front was a bit spotty. Not yet perfect. I had taken on the tedious part of the job but my longtime painter and friend, Terry, was coming over to finish it. I had already purchased FPE’s Slingblade, a medium gray, in their Satin finish which would give the floor sufficient traction and not make it overly slippery. FPE recommended primer plus two coats of their brilliant (high gloss) finish under one coat of satin. Terry disagreed with that many coats of paint on a floor with a history of moisture. So we went with primer plus one coat of satin. If we need to repaint next year there is enough paint left over. I just love how clean it looks. 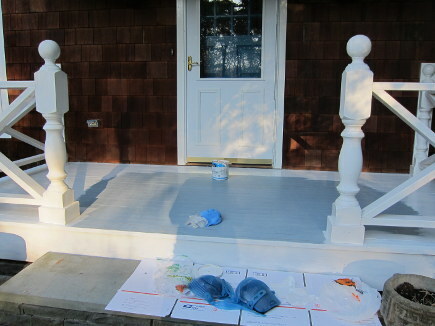 The painted porch needed three days to dry in the cool weather. Fortunately, there was enough sun and the temperature was moderate. For good measure, I left it roped off for five days to cure. I couldn’t be more pleased with the result. The floor has a slight sheen, looks like new and it’s clear that the satin-finish paint adhered well and dried perfectly. Just in time for the annual parade of trick-or-treaters! 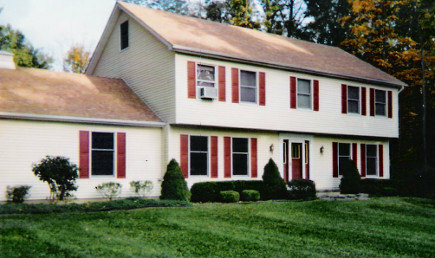 It brought a tear to my eye when I read that it was Mr. AM who wanted to tear off the vinyl siding…I’ve found it’s usually the men who want a maintenance-free exterior and love the vinyl. Vinyl siding is a pet peeve of mine…along with cheap garage doors on expensive homes.